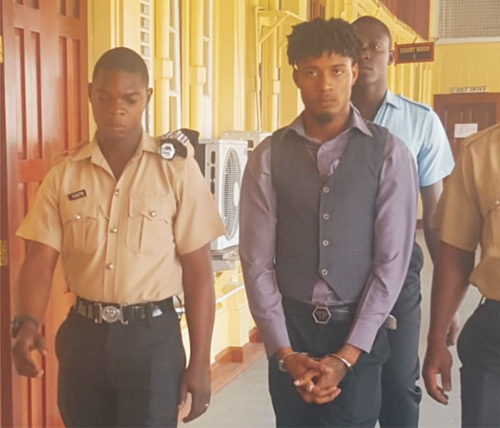 Pandemonium broke out yesterday at the High Court in Georgetown following the sentencing of former Guyana Defence Force (GDF) rank, Allister Woolford, who was jailed for 15 years for shooting his friend back in 2014. The sentencing was handed down by Justice Sandil Kissoon. Woolford, 24, a father of one, formerly of Grove, East Bank Demerara, was convicted on a manslaughter charge on July 30, over fatally shooting Devon Howell. The jury returned a guilty verdict, in proportion 10 guilty to two not guilty. On December 8, 2014 at Lot 100 Republic and D’Andrade Streets, Newtown, he unlawfully killed Howell. Woolford had been out on $400,000 bail pending trial. Based on reports, a gun went off and Howell was shot in his neck. He was rushed to the Georgetown Public Hospital (GPH) where he eventually succumbed almost three weeks after the incident. His upper spinal cord was reportedly damaged as a result of the shot and he never regained consciousness. During November 2014, Woolford was charged with Attempting to Commit murder after Howell remained in a critical state at the Georgetown Public Hospital, days after the shooting. However, after Howell succumbed the charge of Attempting to Commit murder was withdrawn, and a new charge for manslaughter was instituted against Woolford. During an unsworn testimony, Woolford had told the court that he was just joking around with the gun when he shot at Howell. He had told the court that he trusted that his friend, who was also a soldier, would not have given him a gun with live rounds inside. Following conviction, sentencing for Woolford was deferred until yesterday for presentation of a probation report. A Probation Officer attached to the Ministry of Social Protection said that Allister told him that he deeply regrets what happened. The probation officer said that the convict had expressed remorse and indicated that not a day goes by without him thinking of what happened. According to the probation officer, Allister’s father did not play a meaningful role in his life, since he has been incarcerated since 2009. He said that the young adult grew up with his mother who worked as a hairdresser/pastry maker. The court heard from the probation officer that Allister’s family faced financial constraints and as such, he was forced to leave school while in the Ninth grade. To help support his family, the probation officer added that Allister gained employment as a construction worker and enlisted in the GDF when he turned 18. The probation officer disclosed that personnel in the GDF revealed that Allister was a very disciplined soldier who had the potential to go far. But, unfortunately he lost his job due to the incident. Residents in Allister’s former community of Newtown also said that he was a very quite young man and that he and Howell were friends, since they were seen together several times. Even officials at the Lusignan Prison, where Allister is staying, stated that he is well behaved, the probation officer disclosed. The mother of the deceased was called as a witness by the prosecution which was led by State Counsel Abigail Gibbs and State Counsel Mandel Moore. The woman told the court that her son and Allister shared a brief friendship for about five months. When asked by Prosecutor Gibbs if she had forgiven Allister, the woman replied, “No! I will never forgive him,” adding that she has not received an apology or words of sympathy from either Allister or his family. In rehashing the evidence heard during the trial, Justice Kissoon said that Allister, in a statement, said that he jokingly pointed the firearm at Howell and pulled the trigger. The judge told the convict that his actions were not one of a respectable soldier and that it resulted in the death of a young man. In admonishing Allister, Justice Kissoon said, “You had no reason to do what you did. You have failed yourself and society.” The trial judge told Allister that he had shown no remorse for his actions since he pleaded not guilty to the charge, causing the court to go through a lengthy trial. In arriving at a sentence for the convict, the judge started at a base of 25 years. A total of 10 years were deducted for the favourable probation report and the fact that Allister is still a young man. Allister is expecting his second child with his girlfriend who is currently two months pregnant. He has a three-year-old daughter from a previous relationship. Police ranks present at the court urged the parties to calm down and even threatened to arrest them for behaving disorderly. Eventually, things calmed down and the parties went away from immediate surroundings of the court. Woolford retained Attorneys-at-Law Hewley Griffith and Compton Richardson.